A variety of analysts have recently bludgeoned Apple over claims that the company has no real growth prospects until iPhone 7 launches, and even then may not see a return to growth until another iPhone appears toward the end of next year. However, the evidence offered in support of concerns that this fall's iPhone 7 wouldn't drive significant demand is based almost entirely upon rumors looking at physical case prototypes, and ignores the nine year legacy of iPhone launches that have typically focused on faster Application Processors, better cameras, advanced display technologies, and new features unlocked in core software and new apps, not case design tweaks. Prior to iPhone 7 shipping this fall, investors are expressing increased interest in the current impact of iPhone SE, a model that only began selling during Q3. Being virtually identical to iPhone 5s, the model offers no "new" case design whatsoever, but has remained supply constrained due to the fact that it delivers greatly increased processing power and camera features on par with iPhone 6 models. After months of handwringing about the supposed end of smartphone growth--particularly among premium customers--analysts have more recently shifted their tune to praise potential sales of Samsung's flagship Galaxy S7, the very kind of product that is supposed to have reached a dead end globally. While Samsung Electronics hasn't released any actual sales figures for the S7 (it has not ever), nor even detailed the overall performance of its Mobile IM group relative to that of its chips, displays, TVs, appliances and other business divisions, a variety of sources have made big assumptions that suggest Samsung's earnings are related to the performance of its top flagship. A report Vlad Savov for The Verge cited Kantar Worldpanel data that claimed that Samsung's Galaxy S7 had exceeded sales of Apple's iPhone 6s in the U.S., at least since its launch earlier this year. However, what Kantar actually reported (and Savov did not) was that the rivalry between Apple and Samsung appears to be increasingly irrelevant. The firm stated that in the U.S. between May and July "Samsung accounted for 37 percent of smartphone sales and Apple 29 percent. However, sales of their respective flagship models reveal a much closer competition, with the Galaxy S7/S7 Edge accounting for 16 percent of sales and the iPhone 6s/6s Plus at 14.6 percent." So rather than the Galaxy S7 eating into Apple's iPhone 6s customer base, Samsung is merely experiencing its own pent up demand cycle after several very poorly received flagship launches. Samsung's overall sales in the U.S. (the majority of which are middle tier or low end offerings) are significantly higher compared to the performance of its flagship. Even so, the idea that Samsung is returning to growth among commodity Android producers means that Apple too has the potential to grow its own sales of premium phones. Apple has the advantage of being differentiated by the features unique to iOS 10, as well as having a reputation for safeguarding privacy, security and providing years of support via free software updates. Outside the U.S., Kantar noted that Apple's iPhone 6s and 5s were the top two best selling phones in the U.K., "followed by the Samsung Galaxy J5, and the iPhone SE," another idea The Verge failed to mention, as it didn't support the narrative of Galaxy S7 leading Samsung to growth. Later this month both Apple and Samsung will provide more actual detail into the performance of their smartphone businesses, but investors seem to be abandoning the idea that consumers are no longer interested in premium models, and that growth among higher end handsets is over. Samsung does have an advantage over Apple in that its corporate performance is measured in a weaker currency of South Korean Won. Apple's earnings are presented in U.S. dollars, and the strength of the dollar over the last three quarters has effectively repressed sales globally by forcing Apple's prices higher around the globe and exaggerating its revenue declines. Another example of misleading data that investors appear to now be looking at more critically comes from IDC, Gartner and Strategy Analytics. In the first calendar quarter, Strategy Analytics insisted in a public press release that Apple had fallen down to fifth place in China due to strong unit sales by unfamiliar new vendors such as Oppo and Vivo, which had exploded with unit shipment growth rates exceeding 50 percent year over year. Data from IDC and Gartner disagree on the numbers from these vendors by millions of units, but both portray Oppo, Vivo and/or Xiaomi as being major players in China. The problem with only looking at unit market share in China is that this sort of myopic analysis is what previously fooled commentators into thinking that Xiaomi was doing much better than it actually was. That's chiefly because while these vendors sell large numbers of devices in China, they are very low priced models that don't directly compete with iPhones. IDC analyst Melissa Chau was cited in a report by the South China Morning Post as noting that "Lenovo benefited with ASPs [average selling prices] below US$150 in 2013, and Xiaomi picked up the mantle with ASPs below US$200 in 2014 and 2015. Now Huawei, Oppo and Vivo, which play mainly in the sub-US$250 range, are positioned for a strong 2016." 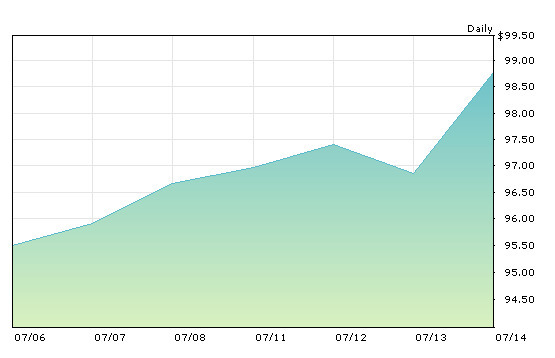 Apple's iPhone ASPs are above $650. So while market researchers report iPhone market share based on around 11.5 million iPhones sold in China (based on Strategy Analytics numbers, above), a number that's between 1 and 5 million units fewer than Vivo, Xiaomi, Oppo or Huawei, the real commercial share grabbed by Apple is far higher. Apple brought in around $7.5 billion from those 11.5 million iPhone sales, compared to maximum potential revenues of between $3-4 billion for Vivo, Xiaomi, Oppo or Huawei. Apple's profit margins are also far higher, meaning that the company has built a sustainable business in China and is competing against waves of different companies that each take turns blowing out large numbers of poorly-differentiated, low end phones before a new entrant emerges and takes away their share. Rather than recognizing this, Strategy Analytics referred to Apple's "lackluster performance" in contrast to Oppo, a company that brought in about a quarter of Apple's revenues while shipping nearly two million more units in the first quarter via razor thin margins. 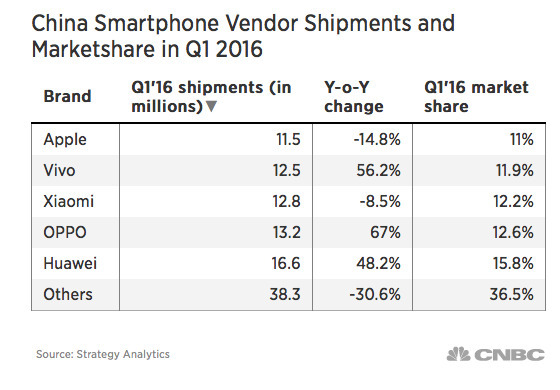 Apple's customer churn rate is also far lower than that among Android vendors in China. As noted by Kantar, "for Apple, 42 percent [of iPhone buyers] were repeat purchasers, and 25 percent came from Samsung," a far higher rate of Android defection compared to what it reported for the U.S.